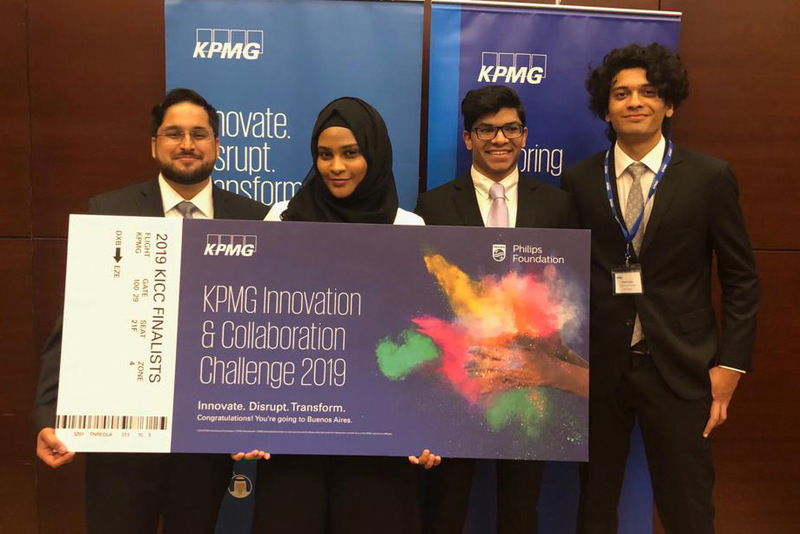 Four RIT Dubai students won the KPGMG Innovation and Collaboration Challenge (KICC) at the national level and have advanced to the grand final in Buenos Aires, Argentina that takes place April 8-11. From the left, Ajinkya Patwardhan, Shaima Muez, Yohaan Jacob and Abdullah Khan. Four Rochester Institute of Technology Dubai students earned an opportunity to become global champions of an international competition that requires them to collaborate, innovate and compete with some of the brightest minds from around the world. The team won the KPGMG Innovation and Collaboration Challenge (KICC) at the national level and have advanced to the grand final in Buenos Aires, Argentina, which takes place April 8-11. The KICC tasks students with presenting innovations that would help to empower people in disadvantaged communities in their country to take control of their own health and well-being. They were asked to choose a client and propose a concept that might include new processes, technology and innovation. The winning team beat out 11 competitors, including two other RIT teams, with their idea of integrating gamification in an app for the Dubai Health Authority that would incentivize preventive health measures. The students on the winning team include Patwardhan; Shaima Muez, a second-year mechanical engineering student; Yohaan Jacob, a third-year mechanical engineering student; and Abdullah Khan, a second-year mechanical engineering student. The team thanked RIT Dubai’s Director of Outreach & Cooperative Education Orsi Urban, Business and Management Division Chair David Egleston and KPMG’s Nina Allison for their support.